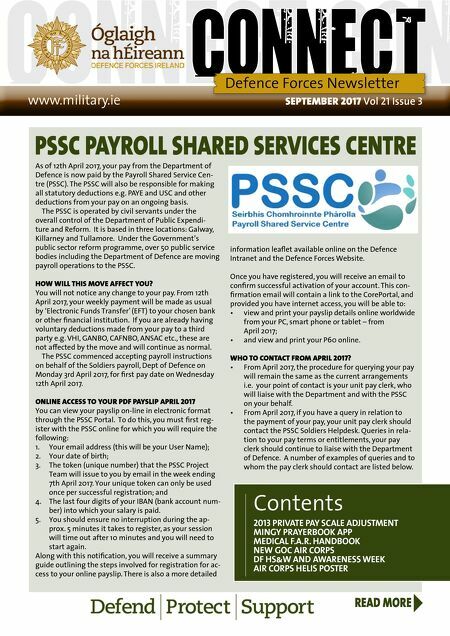 september 2017 Vol 21 Issue 3 www.military.ie Defence Forces Newsletter READ MORE PSSC PAYROLL SHARED SERVICES CENTRE Contents 2013 PRIVATE PAY SCALE ADJUSTMENT MINGY PRAYERBOOK APP MEDICAL F.A.R. HANDBOOK NEW GOC AIR CORPS DF HS&W AND AWARENESS WEEK AIR CORPS HELIS POSTER As of 12th April 2017, your pay from the Department of Defence is now paid by the Payroll Shared Service Cen- tre (PSSC). The PSSC will also be responsible for making all statutory deductions e.g. PAYE and USC and other deductions from your pay on an ongoing basis. The PSSC is operated by civil servants under the overall control of the Department of Public Expendi- ture and Reform. It is based in three locations: Galway, Killarney and Tullamore. Under the Government's public sector reform programme, over 50 public service bodies including the Department of Defence are moving payroll operations to the PSSC. HOW WILL THIS MOVE AFFECT YOU? You will not notice any change to your pay. From 12th April 2017, your weekly payment will be made as usual by 'Electronic Funds Transfer' (EFT) to your chosen bank or other financial institution. If you are already having voluntary deductions made from your pay to a third party e.g. VHI, GANBO, CAFNBO, ANSAC etc., these are not affected by the move and will continue as normal. The PSSC commenced accepting payroll instructions on behalf of the Soldiers payroll, Dept of Defence on Monday 3rd April 2017, for first pay date on Wednesday 12th April 2017. ONLINE ACCESS TO YOUR PDF PAYSLIP APRIL 2017 You can view your payslip on-line in electronic format through the PSSC Portal. To do this, you must first reg- ister with the PSSC online for which you will require the following: 1. Your email address (this will be your User Name); 2. Your date of birth; 3. The token (unique number) that the PSSC Project Team will issue to you by email in the week ending 7th April 2017. Your unique token can only be used once per successful registration; and 4. The last four digits of your IBAN (bank account num- ber) into which your salary is paid. 5. You should ensure no interruption during the ap- prox. 5 minutes it takes to register, as your session will time out after 10 minutes and you will need to start again. Along with this notification, you will receive a summary guide outlining the steps involved for registration for ac- cess to your online payslip. There is also a more detailed information leaflet available online on the Defence Intranet and the Defence Forces Website. Once you have registered, you will receive an email to confirm successful activation of your account. This con- firmation email will contain a link to the CorePortal, and provided you have internet access, you will be able to: • view and print your payslip details online worldwide from your PC, smart phone or tablet – from April 2017; • and view and print your P60 online. WHO TO CONTACT FROM APRIL 2017? • From April 2017, the procedure for querying your pay will remain the same as the current arrangements i.e. your point of contact is your unit pay clerk, who will liaise with the Department and with the PSSC on your behalf. • From April 2017, if you have a query in relation to the payment of your pay, your unit pay clerk should contact the PSSC Soldiers Helpdesk. Queries in rela- tion to your pay terms or entitlements, your pay clerk should continue to liaise with the Department of Defence. A number of examples of queries and to whom the pay clerk should contact are listed below.